A natural gentle skin toner derived from a time honored Native-American formula. 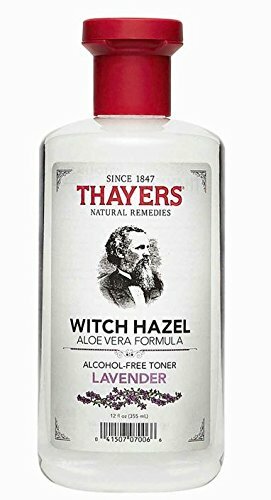 Now people with sensitive skin have an Alcohol-Free Lavender Witch Hazel Toner, with delicate, soothing, calming natural Lavender water. This all-natural toner for healthy -looking skins adds moisture while helping to protect the skin from airborne impurities, and is an alternative to drying astringents. Witch Hazel helps tighten pores and to smooth and beautify the skin. THAYER’S proprietary Certified Organic Witch Hazel (derived from the bark) is not distilled, thereby maintaining all the beneficial natural tannins. Assay of hamamelitannin shows that Witch Hazel bark extract is 21 times richer in hamamelitannin than the leaf extract and 87 times richer than the stem extract (Resource: Vennat, Bl, “Tannins from hamamelis virginiana” Planta Medica 54(1988):454-437).Alcohol FreeParaben FreePropylene Glycol FreeUn-Distilled Witch Hazel (with all the beneficial natural tannins)MoisturizesCleansesRecommend: Apply with a cotton ball after cleansing or anytime throughout the day as a softening refresher.